All of our plans offer basic filtering. You can automatically filter content before it is added to your campaign. 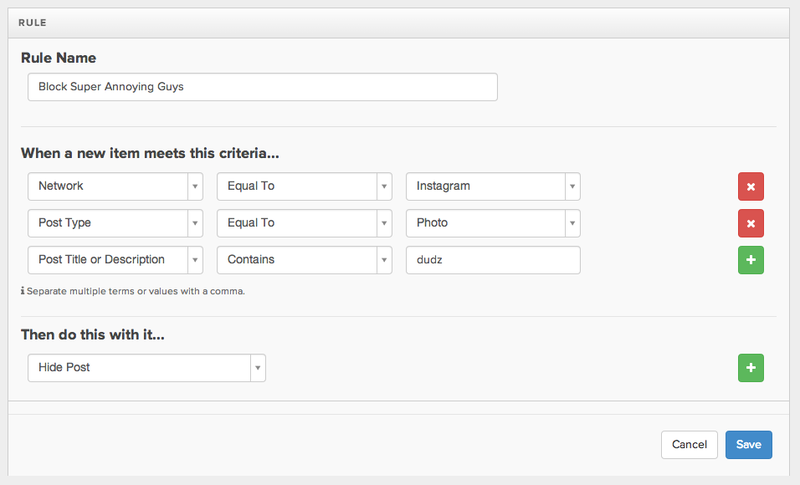 Any new post that contains any username or keyword provided in the filter box will be excluded. Keep in mind that filters only apply to new posts; if you've previously imported posts, then they'll remain on the wall unless you moderate them out or delete all your posts and start over. You can also quickly mute a specific user, so that their posts no longer appear in your campaign. Simply mouse over the offending post and choose "Mute User:"
Our Rules Engine is an extremely powerful way to exclude posts by keyword, user, post, network, or any combination. Rules are a feature of our more advanced plans. Learn all about rules here.